Do You Need a Supersack Unloader? Super sack unloaders, also known as bulk bag unloaders or big bag unloaders, are available in two modes of operation – manual and automated. The manual operation super sack entails the use of a forklift to lift the material onto the super sack frame. 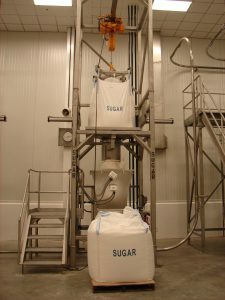 The automated operation super sack uses an electric hoist and trolley to lift material up, and into the frame structure. 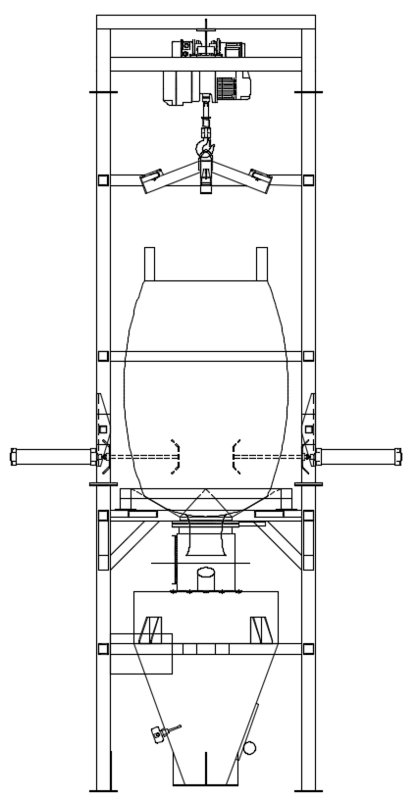 The super sack frame consists of two parts – unloading components and hopper components. The vertical frame members for the sections are constructed of heavy-duty 4” square tubing minimum. 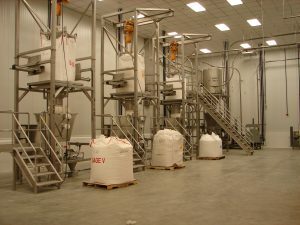 The unloading section includes a bag massager connected to the frame by a heavy-duty support bracket. These brackets support the various massage paddles that are customized to meet or exceed the customers’ requirements. The massagers can be activated manually or can be fully automated to a PLC. During the opening of the super sack, material flow is restrained by an iris valve, allowing the operator to safely have access to the bag tie though the glove box. Once the bag ties have been loosened, the iris valve can be opened, allowing material to flow. Material flow into the hopper can then be controlled by the iris valve and observed through the glove box sight glass. While a 40 cubic foot capacity hopper is standard for Adaptive’s super sack unloader, custom hopper sizes are available.